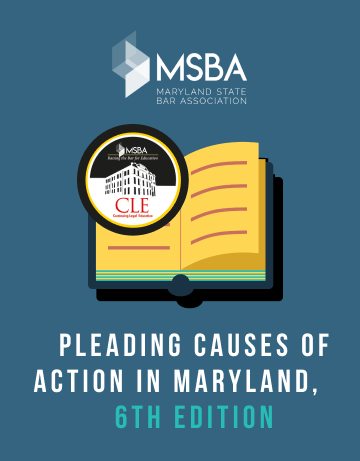 Pleading Causes of Action in Maryland, Sixth Edition is the starting point for drafting and analyzing virtually all pleadings in Maryland. Sandler and Archibald’s practical organization of each chapter and section with a sample pleading immediately followed by their authoritative commentary of the elements of the claim and the issues to be considered, make this an exceptionally easy-to-use practitioner’s and judge’s tool. The authors’ analysis and advice help the reader develop an acute awareness of the strengths and weaknesses of a case, making this an invaluable reference manual for all Maryland lawyers. "This book is both a comprehensive treatise and a practical guide on how to plead virtually every cause of action in Maryland. Every lawyer practicing in the Maryland courts should have a copy in his or her library." addition to every Maryland lawyer’s and judge’s library. Order your copy through MSBA today.